Does your dog or cat's fur always seem to get in a tangled mess? Is it frustrating trying to brush out all the knots to make their fur smooth again? Our Particular Paws Condition Spray would be the perfect fit to get your pet's fur smooth again and smelling fresh! Plus, keeps your frustrations low. It contains no dyes, alcohol, perfumes, or harsh chemicals that can irritate your pet's skin. Our formula soothes and moisturizes dry and sensitive skin so you can feel good about using it on your pet. Grooming time doesn't have to be a hassle. After bathing your pet, follow up with Particular Paws Conditioning Spray. Its no-rinse, leave-in formula cuts down on grooming time, making it easier for both you and your pet. No more fighting to keep your pet in the tub. Safe to use on both cats and dogs! This gentle formula won't interfere with other topical flea and tick products you use on your pet. You don't have to change your pet's regular grooming and care routine to use it. Our Conditioning Spray will make your pet's coat shiny and more manageable. You'll enjoy its pleasant cucumber melon scent that's long-lasting. You can even use it daily as a special daily spa treat! Easy to use! After bathing your pet, simply spray a mist of Conditioning Spray onto your pet's coat while still damp. Hold the spray about six inches from your pet while avoiding the eye area. Work the conditioner into your pet's coat with a brush and either allow to naturally to dry or groom as usual. Satisfaction Guaranteed! If our Particular Paws Conditioning Spray doesn't meet you and your pet's approval for any reason, we'll refund your purchase. All our products are backed by a 100% money back guarantee. Shop with confidence! DETANGLER: Does your pet have hair that tangles and makes it hard to brush? 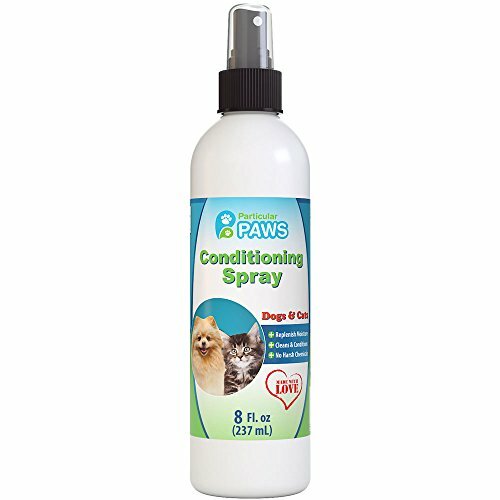 Our Conditioning Spray for Dogs and Cats helps loosen up those tangles and makes it easier to brush your pet. Brushing your pet can be time consuming when you have to work out the knots, but our spray will save you the time and frustration. FRESH SMELL: Leaves your pet smelling fresh and clean. You and your pet will love the cucumber melon smell! Get rid of the stinky smells lingering on your pet, and give them a smell that_ll make you want to cuddle up next to them. MAKES GROOMING EASIER: Grooming time doesn_t have to be a hassle! It_s simple with our no-rinse, leave-in formula. After bathing your pet, simply apply the conditioning spray on their coat and you_re done! No more struggling to keep your pet in the tub. ALL-NATURAL INGREDIENTS: There are no toxic chemicals, dyes, perfumes, or any other unnecessary ingredients in our Particular Paws Conditioning spray. Ingredients are simple and safe: water, nonionic surfactant, polydialkylsiloxanes, fragrance blend, sodium xylene sulfonate, citric acid. 100% SATISFACTION GUARANTEE: Made in the USA in a GMP compliant facility for the best quality. If you_re not satisfied for any reason, please contact us for a hassle-free refund. Our #1 priority is to make sure you and your furry friend are completely happy!